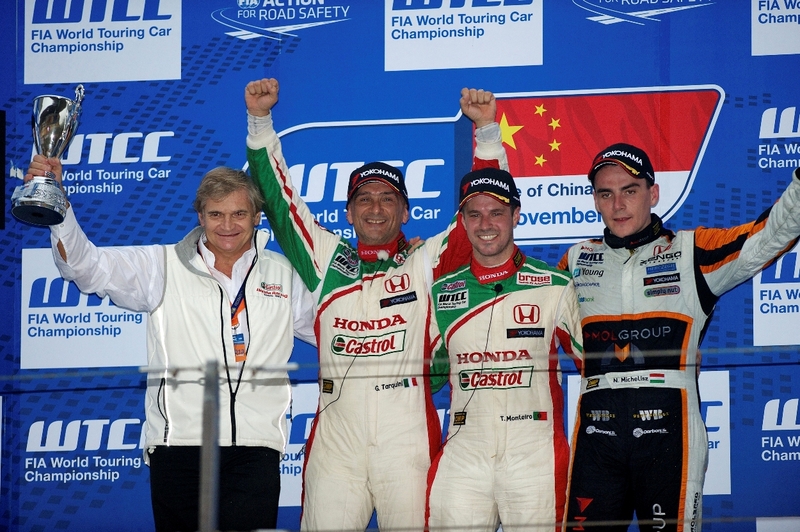 Three Honda Civics made a clean sweep of the podium positions with a commanding first, second and third result in the FIA World Touring Car Championship Race 2 in Shanghai. Tiago Monteiro led into turn 1 from his pole position starting spot and held that place for the entire 10 laps, extending his lead to 1.1 seconds over Castrol Honda team-mate, Gabriele Tarquini. Norbert Michelisz battled furiously for those 10 laps to retain his third place to the end, another fine result for the young Hungarian star and his popular Zengo Motorsport team. This was the second clean sweep for Honda having achieved the same impressive result at the Slovakia Ring event earlier in the season. 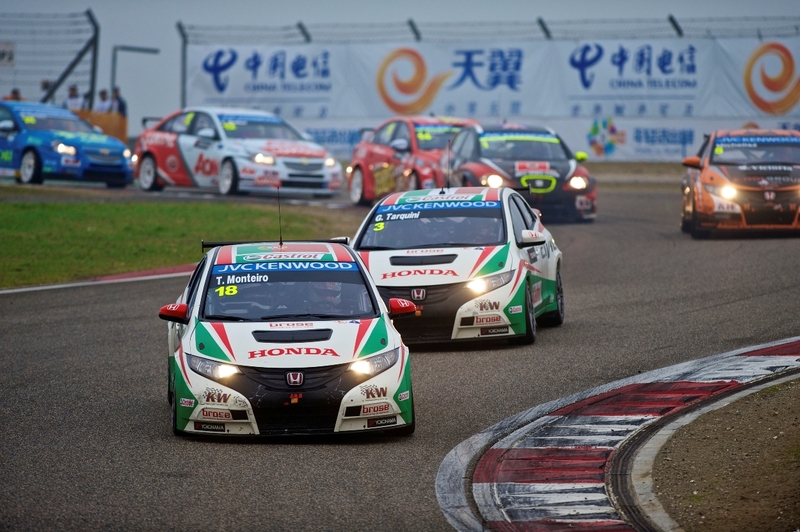 Victory in China is the third for the Castrol Honda team and the fourth in the season for the Honda Civic WTCC cars in the first full season in the WTCC. Each of the three Honda drivers has taken at least one race win this season so far. For Monteiro this was his first victory of the season and first with the Honda Civic, having been at the wheel since Honda launched its WTCC challenge in the last three events of 2012. “That is an amazing result for me and Honda with my team-mates too. Every time we race we improve and this is a great reward for the whole team. I want to thank everybody for making this happen, I’m proud to be part of this great Honda project. I dedicate this win to my mother who is recovering from recent health problems,” said Tiago climbing out of his number 18 Civic. Earlier in Race 1 damp conditions had forced the start behind the Safety Car for the first two laps. When racing proper commenced Tarquini was in a seven car battle for the duration, finally taking 7th place at the flag. Michelisz finish 10th and Monteiro 11th. For Race 2 track conditions improved to allow slick tyres to be used, but the heavily overcast skies meant the cars ran with headlights blazing for the whole race. From the start of Race 2 the three Hondas set the pace, Tiago and Gabriele slipstreaming away from the pursuing pack where Norbert showed his indomitable spirit and concentration to retain his grip on the third position against sustained attack from reigning WTCC Champion Rob Huff.